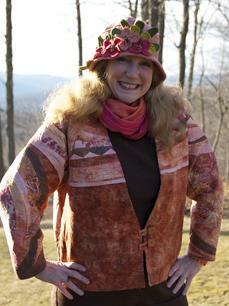 Lisa models the "Wild Woman Jacket" and "Flapper Nan Hat." Photo and jacket, Karen Eckmeier in "Wearable Waves" 2012. 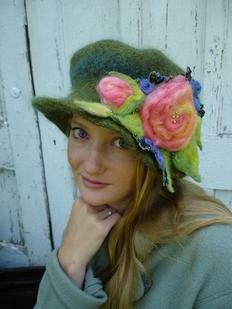 Hat by Lisa Cruse. 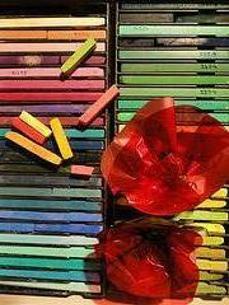 ART PAGE currently under construction--- Please return at a later date for photos of Lisa's fine art and encaustic work. Thank you for your patience. allowing you to create your own embellished masterpieces. created and bespoke designs. Just ask. of the Tacoma, WA, area have been creating a sensation and it's no wonder. They'd rather be knitting, NAKED---for Autism, that is. They all dropped more than a stitch or two to produce a captivating calendar for the year 2011 and have done it again for 2013! Done tastefully in sepia tones with bare minimum knitted garments on display, each page is a testament to the fun that can be had when mixing knitting, friends and a serious loss of inhibitions. Not shown but quite in evidence are the big hearts behind this project which was sparked by awareness in Marsha's family with her twin grandchildren, Mollee and Josef, both of the Autism spectrum. 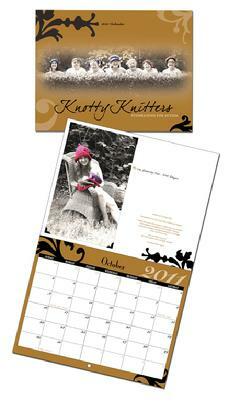 Marsha Cunningham--- hats off to you and best wishes for another successful calendar. Lisa at Tinsel Trading, NYC, finding enchanting bits for her working collection. Projects Page for more offerings. 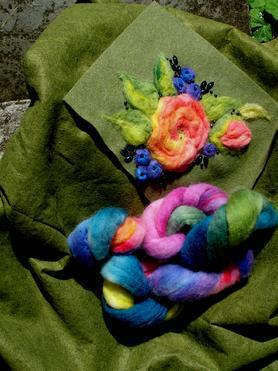 Since 2008, Ambrosia Cottage has happily presented fiber especially dyed for needle felting! Lisa hand-dyes roving into glorious rainbow hues, spilling into each other for unlimited color mixing. "Colorspills" were used here to create the Roving Roses for the Ashford company in New Zealand. Kaysa models Roving Roses in Relief. Colorspill roving and Roving Roses in Relief. Products available at The Cottage.